A train collided with a truck near the Israeli city of Ashkelon on Tuesday afternoon, killing several people and wounding more than 100 others, according to Israeli officials. "There are a number of dead here that have not been evacuated. Unfortunately a baby is among the dead. They're covering the bodies with blankets," said Eli Eskozido, a local area council member. Ambulances raced to the scene and helicopters circled overhead. At least two of the train cars derailed and were on their sides, rescue officials said. Israel's Magen David Adom rescue service said more than 100 people were wounded, three of them seriously. They said they did not have any information on the number of dead. The accident happened about 150 meters off the main roads, and rescue workers said they had a difficult time moving the wounded to the ambulances. "We are getting the wounded out to hospitals as quickly as possible," said Uri Bar Lev, the southern police commander. "There are apparently also dead, but we can give numbers only later." "There are dozens of dead and wounded. It's a horrible sight. It looks like a terror attack," a medic identified as Dudi told Israel Radio. "One of the railroad cars is upside down, and it's impossible to tell what's inside," he said. "It's the worst accident I've ever seen." 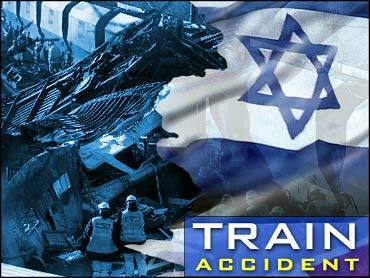 A man identified as Ofer said he was sitting in the front car of the train when the accident happened. "Suddenly there was a sharp hit and the whole car moved sideways," he told the radio.